As a fish surveyor it is always exciting, sometimes daunting, to come across schools of fish in the thousands. 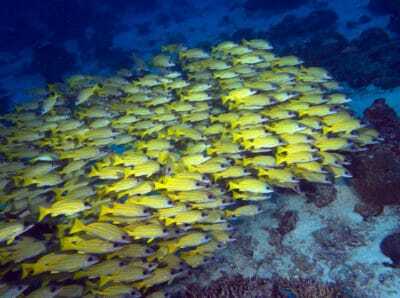 We have seen huge schools of fish in other areas we surveyed on the Global Reef Expedition, especially during our mission to BIOT. When we were preparing for this mission we were unsure what the fish communities would be like as over 30% of the human population fishes and fishing is the second largest contributor to the nation’s GDP. Our first few dives around the island of Gili Lankanfushi here in the Maldives were beautiful. Fish diversity was high, with most families represented. 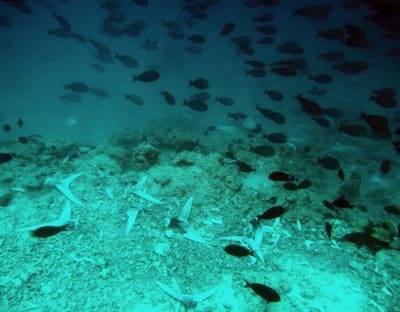 The density of fish was fairly low along the main stretch of house reef, although occasional schools of blue-lined snappers (Lutjanus kasmira), striped large-eye bream (Gnathodentex aureolineatus) and yellowfin goatfish (Mulloidichthys vanicolensis) would move around us as we surveyed and collected COTS. It was when we began moving north along the reef and dived in the channel between Gili and Himmafushi that the fish community was astounding. 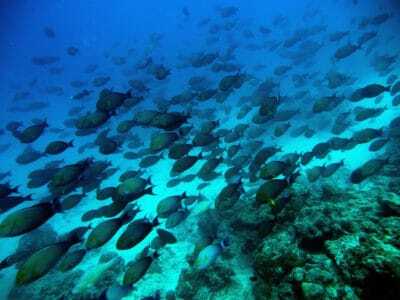 Fish tend to school near channels, as the water movement increases the availability of nutrients and plankton. Further, the tuna processing plant on Himmafushi and the fishing vessels regularly discharge tuna bones and carcasses into the channel. This attracts huge schools of opportunistic feeders and scavengers, and schools of planktivorous fish. 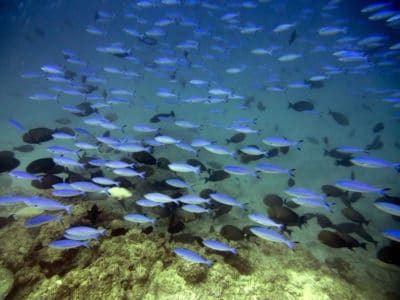 Through the murky waters, at around 13-15m depth, schools of hundreds to thousands of bluespine unicornfish (Naso unicornis), humpback unicornfish (Naso brachycentron), yellowfin surgeonfish (Acanthurus xanthopterus), bluefin trevally (Caranx melampygus), lunar fusiliers (Caesio lunaris) and yellow-lined fusiliers (Caesio varilineata) filled the water column. In addition to these large schools, several enormous Napoleon wrasse (Cheilinus undulatus), whiprays and red snappers (Lutjanus bohar) were taking advantage of an easy feed. We were later told by the resort marine biologist that they normally see large pods of dolphins around this area as well. It was a great treat to take a break from collecting crown of thorns starfish and float in the water column as the large schools of fish surrounded us. The resort’s dive team had never dived this channel before and were excited by what we had to them about the giant schools of fish we saw there.